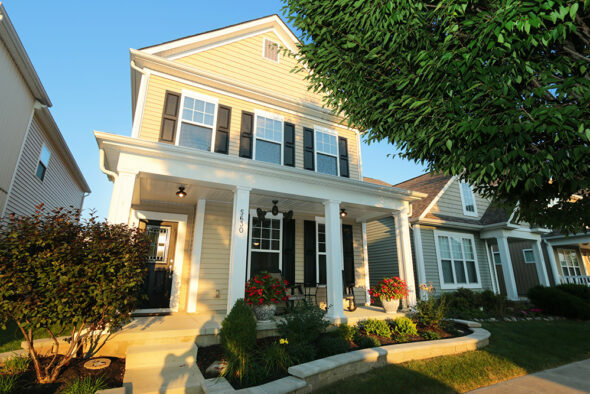 Home » Better than new Hayden Farms single family! Better than new Hayden Farms single family. Watch the sun set from your full front porch with oscillating ceiling fan or enjoy the warmth of the gas fireplace this winter. The first floor of this home offer a spacious living room with gas fireplace and built in book shelves, study/den alcove and an entertainers kitchen big enough for formal/casual dinning with additional seating. The kitchen island was rebuilt to accommodate a flush granite surface ideal for entertaining. The kitchen also offers 42 inch cabinets and designer tile back splash. The second floor features a vaulted owners suite with ceiling fan, gracious hall landing area big enough for a second den as well as two more bedrooms, full bath and laundry. Rear yard is bigger than fenced area.